Greetings. I'm Jessica Menton, here with your daily dose of markets. Stocks futures are gaining after stabilizing Monday. Investors looking for further clues on the health of the economy will be parsing data on consumer confidence and housing starts. With data on pending-home sales and new-home sales also on the docket later this week, I take a look at how shares of home builders face another test after rebounding this quarter. Mortgage rates have fallen as the spring homebuying season begins. 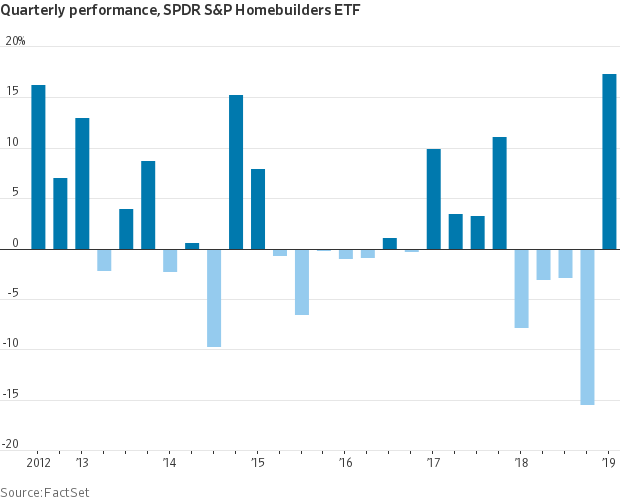 The SPDR S&P Homebuilders exchange-traded fund, which includes building-products and home-furnishing companies, has rallied 17% so far in 2019 and is on pace to snap a four-quarter streak of declines with its best three-month period since 2012. The ETF was walloped last year, sliding 29%, including a 15% drop in the fourth quarter amid a broad stock-market selloff. Rising borrowing costs had held back refinancing and weighed on the buying market, slowing the pace of home-price growth. But this year, shares of Beazer Homes, Lennar, KB Home and D.R. Horton have all rebounded, soaring at least 20% apiece, while NVR and Toll Brothers have gained 16% and 11%, respectively. The housing sector has shown signs of life recently as the spring homebuying season gets under way. Sales of existing homes jumped 11.8% in February from the prior month, suggesting a decline in mortgage rates has buoyed housing demand. A gradual decline in mortgage rates this year has come amid a slump in bond yields, sparked by a dovish Federal Reserve and renewed investor angst over slowing global growth. The yield on the benchmark 10-year U.S. Treasury note, a barometer for mortgage rates, settled at 2.418% Monday, its lowest close since December 2017. Yields fall as bond prices rise. Still, home builders face challenges such as labor shortages, rising materials costs and a dearth of inventory. Although those issues are expected to pressure margins again this year, they are likely a short-term headwind, according to Iman Brivanlou, managing director and lead portfolio manager at asset manager TCW Group. The S&P 500 has climbed 12% this quarter, which would mark just the 11th time the broad index has gained more than 10% in a first quarter since 1950. Of the 10 previous occasions, the index has risen 90% of the time the rest of the year. The last time the index fell after posting a 10% or more gain in the first quarter was in 1987, the year of the stock-market crash known as Black Monday. Of the 105 companies in the S&P 500 that have turned in earnings-per share guidance for the first quarter, 73% have issued projections weaker than consensus analyst expectations, according to FactSet. That's above the five-year average of 70%. On this day in 1979, OPEC declared following a meeting in Geneva that its members would raise the price of crude oil from $13.34 to $14.55, igniting another round of global inflation. On Monday, crude prices dipped 0.4% to settle at $58.82 a barrel. The Philadelphia Fed’s Patrick Harker speaks on the economic outlook at 8 a.m. ET, and the San Francisco Fed’s Mary Daly speaks about the Fed's inflation target at 3 p.m. ET. U.S. housing starts for February, released at 8:30 a.m., are expected to slip to an annual pace of 1.21 million from 1.23 million a month earlier. The S&P/Case-Shiller home-price index for January is out at 9 a.m. The Conference Board's consumer confidence index for March, released at 10 a.m., is expected to rise to 133.0 from 131.4 a month earlier. The Richmond Fed's manufacturing survey for March is also scheduled for 10 a.m.
President Trump heads to Capitol Hill for lunch with Senate Republicans, and in the afternoon meets with members of Congress at the White House to discuss trade. Lyft is leading a wave of startups that will make debuts with giant losses. 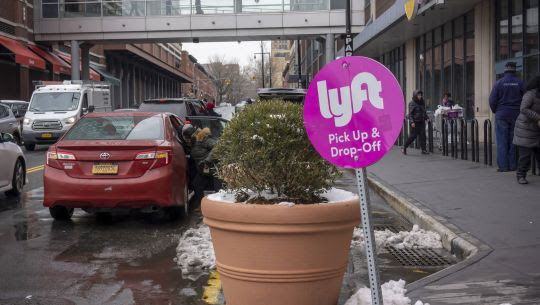 With its IPO expected this week, Lyft will stand as the biggest test of the public market’s appetite for money-losing companies since the dot-com era. Japan’s watchdog accused a Citigroup unit of manipulating a bonds futures market. The Securities and Exchange Surveillance Commission recommended a $1.2 million fine for London-based Citigroup Global Markets. The Apple Card is here, with cash back and privacy promises. The card will charge no fees, pay daily cash rewards and sync with consumers’ iPhones to analyze their spending. Cryptocurrency miner Bitmain’s Hong Kong IPO application lapsed. One of the world’s largest makers of cryptocurrency mining equipment shelved plans for an initial public offering, becoming the latest casualty of the industry’s worst slump in years. Banks got a break on hedging. Banks will be able to more easily hedge against the risks of the loans they originate without triggering stricter regulatory requirements, under rule changes made Monday by a federal markets regulator. Venmo to users: If you owe us money, we’re coming for it. The payments service is trying to curb its losses. But some users say Venmo is going after the wrong people. McDonald’s: The fast-food chain is nearing a deal to buy Israel-based digital startup Dynamic Yield in a bid to up its game in online marketing, The Wall Street Journal reported late Monday. Red Hat: The software-and-services provider missed analysts' revenue expectations in the fourth quarter. Canopy Growth: Shares of cannabis companies came under pressure Monday after New Jersey lawmakers postponed a key vote on a bill over recreational marijuana use. Nike: Shares of the sportswear-maker gyrated Monday after attorney Michael Avenatti was arrested for attempting to extort more than $20 million from the company.